Finally, the input source switch allows a user to choose which audio source should be routed to the line-out device. For this I wrote a little web app, which can be controlled by any computer with a web browser on my LAN. It’s written with jQuery-mobile, so it works nicely on the iTouch. 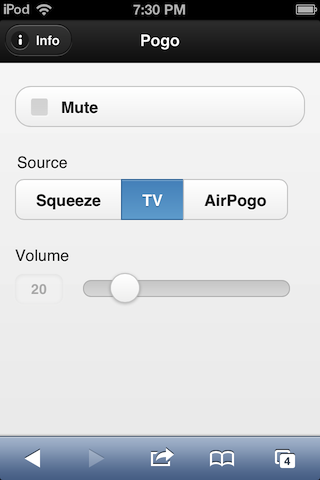 The source code for this app is available on GitHub.This is the final piece needed to make the iTouch into a universal remote: it can switch between music sources, play audio with iTunes/AirPlay, control Squeezelite with iPeng or the Logitech Squeezebox app for iOS, and adjust the TV volume. one question, how do you managed his to switch between the audio source? I’m working on a similar project with a RPi and have alsa dmixer still not completely understood.is it possible that you post your /etc/asound.conf? or you have written a script? Finally, the input source switch allows a user to choose which audio source should be routed to the line-out device. For this I wrote a little web app, which can be controlled by any computer with a web browser on my LAN. Itâ€™s written with jQuery-mobile, so it works nicely on the iTouch. ?